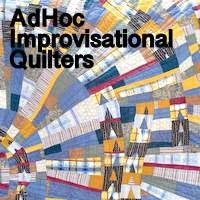 We have always been keen that AHIQ should take an organic approach, sharing and learning from each other as we go along, so this second 'why don't you try this' post springs from the developing idea of Modern Utility quilting, and from recent posts by Ann, Maureen and Julie about things they have been working on. If you are looking for ideas on how to start something, why not start with what you know, work with what you have? I mean this in the broadest possible sense - both in terms of materials and of ideas. So, for starters, how about some improv that doesn't discard all the things we already know about how to work with blocks, but retains the bits we like the best and re-imagines them - puts them with new neighbours, in new contexts? Gwen Marston's vision of liberated quilting is well known by now, and I guess for some people can seem a bit too easy, or cliched, but personally I love the old blocks, the log cabins, the stars, hst's, and I like to include them in my work. I do this for three reasons: firstly because I like the direct reference to what has gone before, which I feel roots me firmly in the traditions of previous generations; secondly because they can be a good way to add a bit of structure, to stop my work from descending into visual mush; and thirdly I just really, really like how they look! That's just me, but that's the whole point, isn't it? So, if you like a particular block, going improv doesn't preclude using it, it just challenges you to look at it with fresh eyes. If you like to applique, or sash, or foundation piece, work with strings or always use a border, the same thing applies: look at what you know and what you like, then push it a bit and see what happens. You could do what Ann is trying and work with a traditional block in a new way, you could use made fabrics rather than yardage, you could cut free-hand, slice into blocks, add inserts...the possibilities are limited only by our inclinations and preferences. To take this a step further, why not start with something you already have - an orphan block, a UFO, a pile of scraps from a previous project, and go from there. I always have little blocks that don't make it into my tops: they sit around in my scrap box looking sorry for themselves and occasionally, if they are very lucky, make it onto a back. I'm pretty sure I'm not the only one who has stuff like this, so go ahead, dig something out and have a play! Labels: AHIQ, improv, Modern Utility, Why don't you try this? Have you been snooping around in my subconscious? I went in search of a new start last night, after a week of high family drama and busy-ness that kept me out of the sewing room entirely. Digging through the "starts" I found a sheet of strings I had made some time back, with something in mind, but what? I'm off to find out now. Bravo!! Right on! I'm one of those who thinks of Gwen Marston's Liberated Quilting II as classic rather than 'easy'. Women and textiles artists for centuries have been using what they have and adding their own spin to make things for utility and things for show or art. Thoughtful post, Kaja. Good idea to start with a UFO block. Using some basic units or traditional blocks can add structure to a top. We always need reminding to start with what we know and like. I've just been gifted a pile of blocks I was wondering what to do with so this has me thinking, thanks for this series - loving it! I just found your blog and feel it is my lucky day!!!!!!!!! Hi Linda, in that case I'm very glad you found me! You are a no reply blogger, so I couldn't reply directly, so am hoping you will check back: if you do, drop me a line with an email and I'll reply straight to you. Kaja, you are so inspiring! Lots of what you wrote has my gears moving and I think you might just be getting me over a bump. This series is truly off to a running start. I'm so glad that you and Ann are doing this!